This looks like a fairly standard login page, but it’s not. 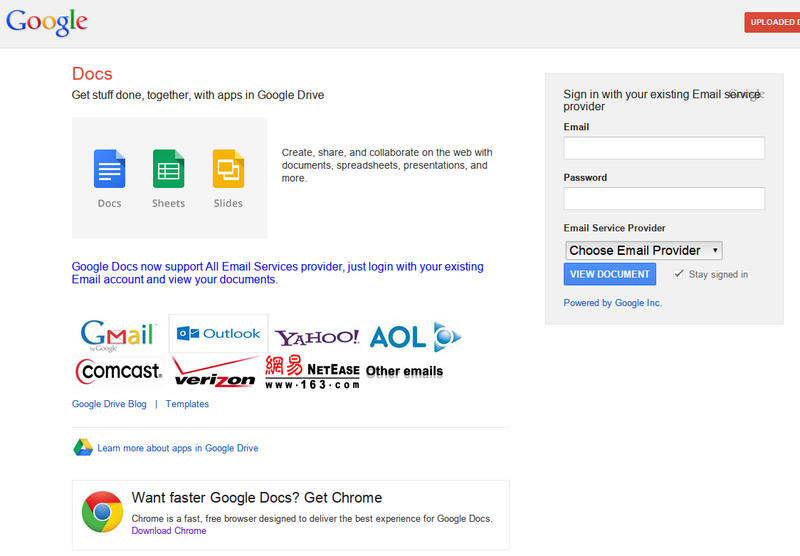 It’s what we call a “phishing” page, a site run by people looking to receive and steal your password. If you type your password here, attackers could steal it and gain access to your Google Account—and you may not even know it. This is a common and dangerous trap: the most effective phishing attacks can succeed 45 percent of the time, nearly 2% of messages to Gmail are designed to trick people into giving up their passwords, and various services across the web send millions upon millions of phishing emails, every day. Here's how it works for consumer accounts. 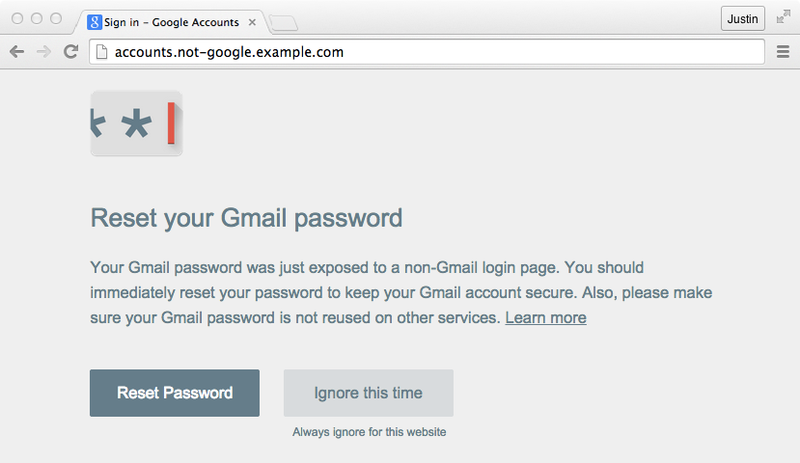 Once you’ve installed and initialized Password Alert, Chrome will remember a “scrambled” version of your Google Account password. It only remembers this information for security purposes and doesn’t share it with anyone. Next, if you type your password into a site that isn't a Google sign-in page, Password Alert will show you a notice like the one below. This alert will tell you that you’re at risk of being phished so you can update your password and protect yourself. 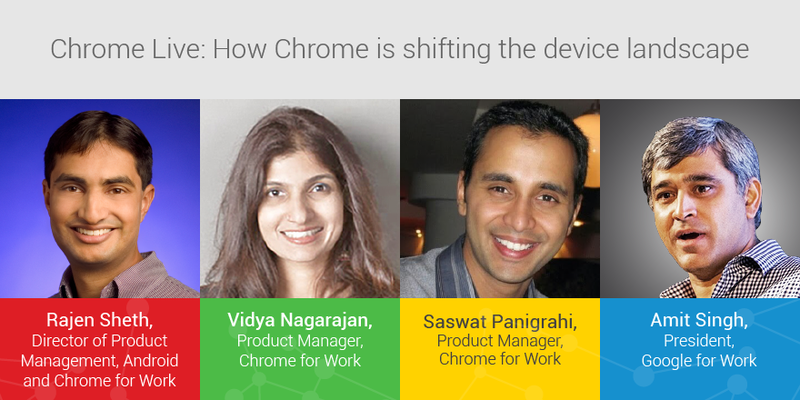 Today at Chrome Live, we showed how Chrome continues to make the way we work faster, simpler and more secure, while businesses like Netflix, Pinterest and Chico’s shared how Chrome for Work is bringing innovation to their workplaces. Chromebook integration with Box for more ways to bring your files to the cloud: Now, you can seamlessly access your Box documents from a Chromebook, just as you would access your local documents. This means that with your Chromebook, you’ll have access to even more applications, no matter where you are. Bringing face-to-face meetings to larger rooms: Last year, we launched Chromebox for meetings so you can have face-to-face conversations with colleagues in remote offices and still feel like you’re in the same room. Today, we announced a new version of Chromebox for meetings that powers meeting rooms fitting up to twenty people. The hardware in the bundle includes a Chromebox powered by Dell, Asus, and HP, a pan tilt zoom camera, and more; just bring your own display. From huddle rooms to large conference rooms, you can now affordably bring video meetings to more office spaces. Improvements to Chrome management for Chrome-dedicated devices: A few weeks ago, we announced over a dozen Chrome partners in the digital signage space. We’ve also improved ongoing reporting to monitor the health of your kiosks and signage at all times. You’ll get alerts from Chrome management if a screen goes down and can remotely reboot the device to get it back online without dispatching a technician. 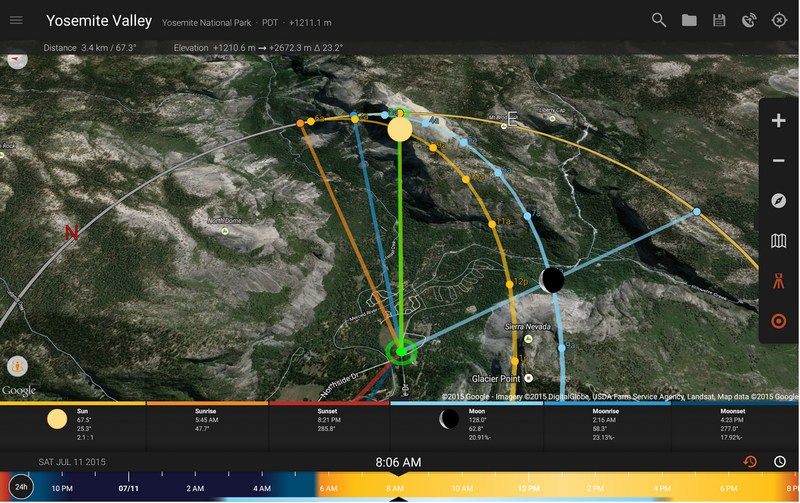 You can also get live updates about system usage and capture screen grabs to see exactly what viewers see. Bringing Chrome management pricing flexibility to more places: We’re adding pricing flexibility to Chromebook management at a subscription fee of $50/year and announcing availability in seven new countries: Japan, Australia, New Zealand, Thailand, India, UK and France. If you weren’t able to attend the live session, you can still watch the event on demand. 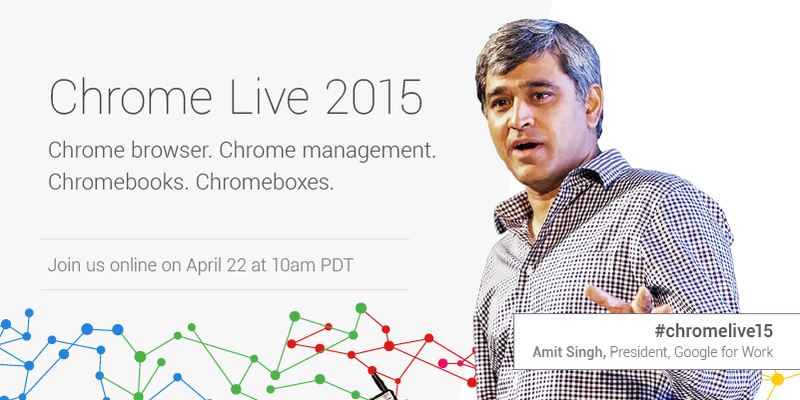 Feel free to share your thoughts, impressions and questions using #chromelive15 on social media. It’s easier than ever to share ideas across the world. But as technology keeps advancing to connect us, so do the techniques of those with bad intentions. The number of records breached in 2014 was staggering; weak usernames and passwords remain the leading cause. The introduction of 2-Step Verification added a layer of security for your Google Account, but we knew more could be done. That’s why Google, working with the FIDO Alliance standards organization, developed the Security Key — an actual physical key used to access your Google Account. It sends an encrypted signature rather than a code, and ensures that your login cannot be phished. And using this key saves you time — when you need to verify your Google Account on a Chrome browser, the key’s light will flash. Just tap it and the signature sends automatically. In fact, when we rolled the Security Key out to Googlers last year, they loved that it was so much faster than when they had to enter a code. Admins can order Security Keys from online retailers or directly from a manufacturer. Multiple models are available and prices start at $6 per key. You can have a smaller model permanently in the USB slot, so it’s available at your fingertips or carry a larger removable model on your keychain or in your wallet. We hope you also take advantage of what the Security Key can do to help protect your organization. Learn more. 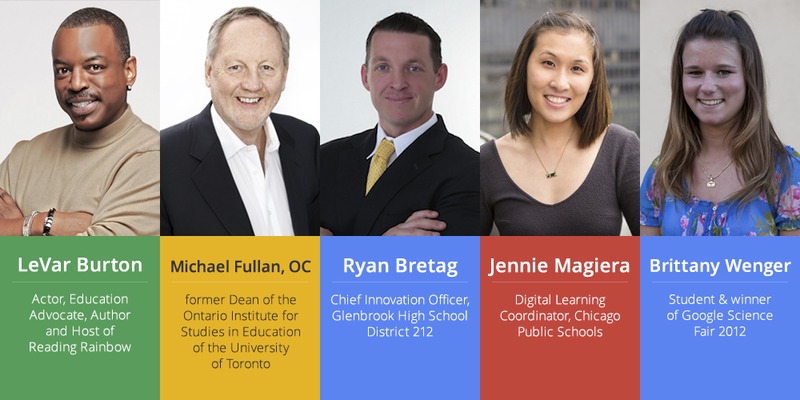 Editor's note: During Education on Air, Google’s free online conference May 8-9, we'll be discussing how we can help prepare our students for their future. To investigate this issue in more depth, we commissioned The Economist Intelligence Unit to conduct global surveys of senior business executives, teachers, and students, ages 11-17 and 18-25. Editor Zoe Tabary will share the findings during the kickoff session for Education on Air, but here’s a preview. 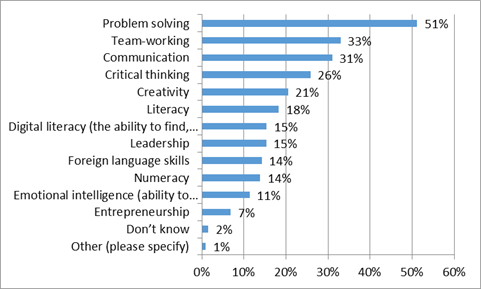 Problem solving, team working, and communication (a trifecta commonly known as “21st century skills”) are the most-needed skills in the workplace, according to our recent surveys of business executives, students and teachers. Digital literacy and creativity— and the latter’s close relative, entrepreneurship—are expected to grow more important in the next three years. To hear more about the full research findings, register for the free online conference. As an IT admin you want your organization to be free to focus on getting stuff done. But part of your role is also to make sure you stay on top of legal compliance. 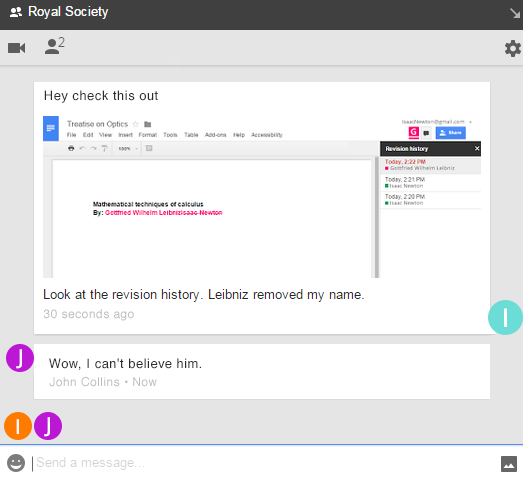 Today we’re making it a little bit easier to do both with two new Hangouts features. Over the next few days, we’ll roll out an admin option that lets you manage Hangouts chat history in your organization, so that you can make certain that it’s either on or off. People in your organization can have the freedom to chat with whomever they want — whether that person is part of your organization or not — and you can be sure that new employee conversations stay personal and private, because they’ll disappear shortly after taking place. 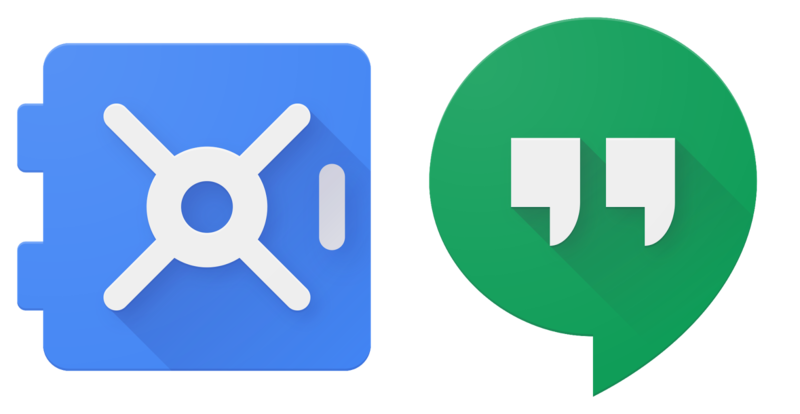 We’re also adding Google Apps Vault support for Hangouts chat. With Vault support for chat, organizations of all sizes can quickly find and preserve chat messages. This is a great way to safeguard business-critical information for continuity, compliance and regulatory purposes. Find out how to tailor Hangouts to best suit your organization's compliance needs. Cross-posted on the Google Cloud Platform Blog. As the most recent and deadly Ebola outbreak spread in Guinea, Sierra Leone and Liberia, the global philanthropic community sought new and innovative ways to raise money for much needed awareness and relief. Band Aid 30 was imagined as a modern echo of the original Band Aid’s successful campaign to address hunger in Africa. A global team immediately set out to organize a live performance that would feature dozens of the world’s top music artists. Sounds a bit ambitious, right? In this case, as with many ventures that make a true impact, the team behind the scenes was a lot smaller than you’d think. The number of developers responsible for deploying the website for this fast-paced, globally critical project: two. Mukesh Randev and Jonathan Horne, web developers from a cutting edge media agency in the UK called Adtrak, took the job on with great urgency. A couple of nice chaps in Nottingham, trying to change the world. Well, ok, mostly trying to keep the website online. The project came together in just shy of 14 days, so things were a bit frenetic. The logos changed 17 times. Layout and top billing were in constant flux. The front page had UK and US donation links… or maybe just UK? 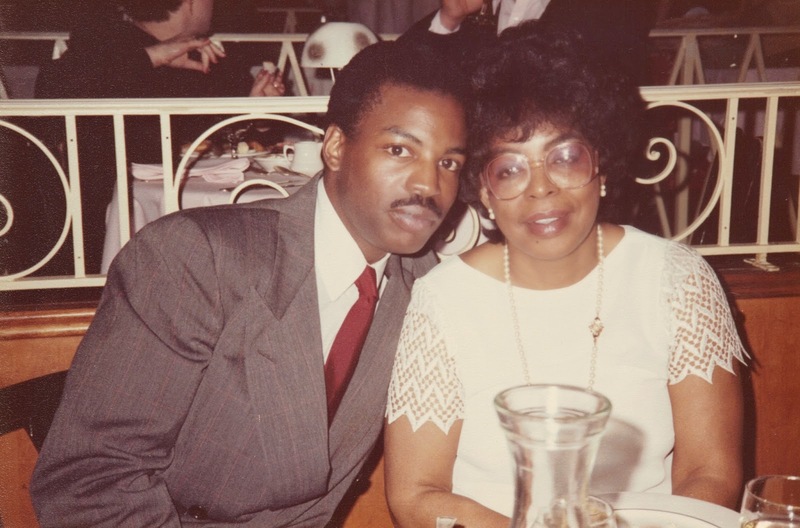 Looming in the back of Jonathan’s mind was the fact that when this site goes live, and several dozen artists with an aggregate 100+ million twitter followers all invite the world to donate, the traffic would be coming fast and heavy. They were using Google Cloud Platform, which was a bit new to them, and they were really eager to set up automatic scaling so that they’d be able to handle the load. They were also using Google DNS to direct traffic to a Google Compute Engine instance hosting Wordpress and using a local instance of MySQL as the database. 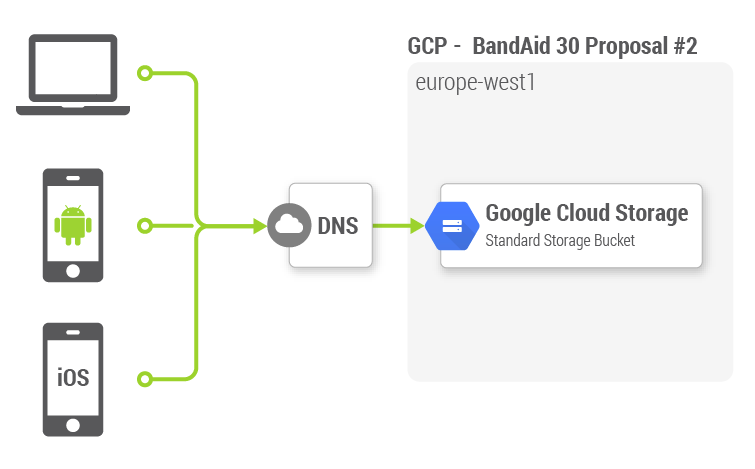 Because 100% of the site was static, rather than creating all of the above services, we simply copied the Band Aid 30 website to Google Cloud Storage. Cloud Storage is integrated into the Google front end, a powerful distributed edge routing and caching system that provides incredible performance for serving static content. 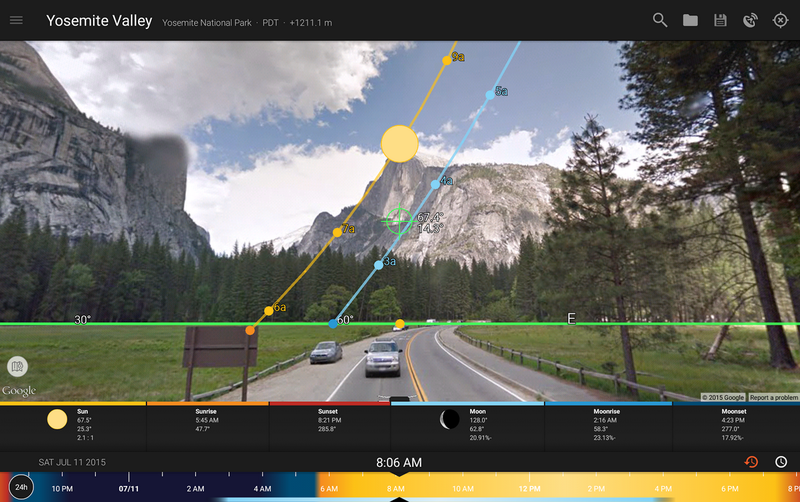 Just imagine how much content is being served through this system for YouTube, Google Play, Picasa... it’s staggering! That’s it! This solution had simplicity written all over it. Simplicity also meant cost savings. The dynamic setup – which is obviously more functional – allows lots of simultaneous site editors, data-driven features and richer logging, but is also substantially more expensive to operate. We think all of that would’ve looked something like this, and cost in excess of $10,000 USD per month. Now, compare that to what we actually built. It only cost $9.17 (yes, you read that right) to run this production website on launch day, without a single performance hiccup or any risk of operational crisis. It just worked. We’re really excited about the positive impact in Ebola victim’s lives that Band Aid 30 is making, the outstanding execution under pressure that Mukesh, Jonathan and the whole Adtrak team delivered (in less than 14 days) and our opportunity to help in this little way.